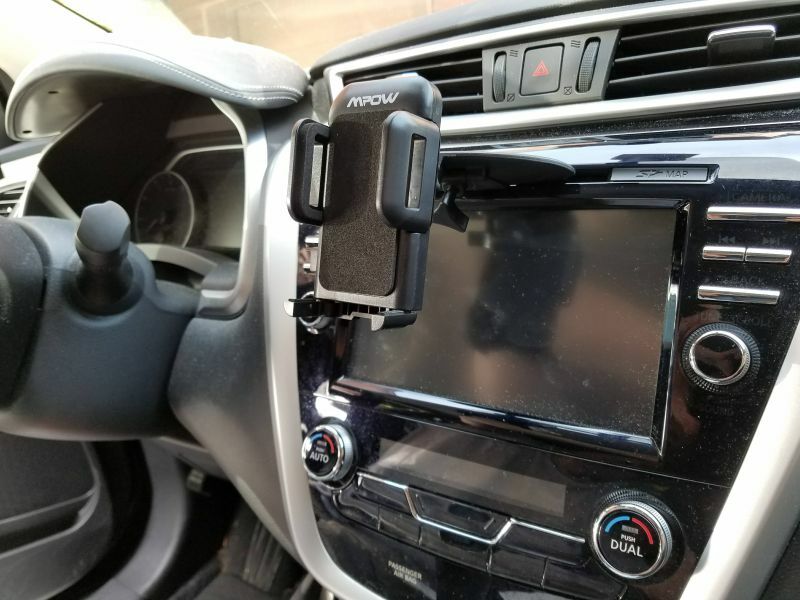 With every iteration of the Apple iPhone, we publish an article aimed at providing guidance on some of the better car and motorcycle mounts on the market. So here’s our latest article on a selection that will fit the Apple iPhone 8 and Apple iPhone 8 Plus. First let’s check the dimensions as we’ll need that to select the right mount. Dimensions have not changed too much. Sporting a 4.7 inch diagonally measured screen, the Apple iPhone 8 measures 5.45 inches tall by 2.65 inches wide by .29 inches deep. The weight is 5.22 ounces. The larger iPhone 8 Plus checks in with a 5.5 inch diagonally measured screen. This iPhone measures 6.24 inches tall, 3.07 inches wide and .29 inches deep. The weight is 7.13 ounces. These are the dimensions without a case. These phones are getting even more expensive so be sure to add a solid case or skin. It will pay for itself many times over by preventing a shattered screen or damaged body. We continue to recommend Otterbox and have an article to help select the right Otterbox Case. The cases are a bit more expensive than some others. Regardless of what brand you use, be sure to include the increased size in your mount measurement. For those with an older custom iPhone mount which features a cradle specifically made for your iPhone, they are unlikely to fit and you will need to purchase a new mount, or at least a new cradle. A universal cradle mount for an older phone may open wide enough to hold your new Apple iPhone 8 or iPhone 8 Plus series without a problem. From experience, you should be able to reuse your existing universal mount for an iPhone 8, but maybe not for the iPhone 8 Plus. It all depends upon the size of your older phone. We like universal mounts for the reason we just mentioned. There’s a good chance it will continue to fit your upgraded phones. Just be sure to get one that features a tight grip. So let’s look at some good mounts for the Apple iPhone 8 and iPhone 8 Plus. Starting with car mounts, consider a windshield candidate such as the Arkon Slim Grip Ultra Travel Mount. The cradle opens to over seven-inches which is easily large enough to hold your Apple iPhone 8 or iPhone 8 Plus with or without a case. This mount features an expandable cradle with legs which move from side to side to accommodate buttons and cables. The mount can be adjusted at the base and cradle. The phone can swivel 360 degrees in this mount. The included adhesive dash disk can be used to turn your windshield mount into a dash mount. This is nice for states that may not permit mounting to a windshield. Another popular mounting location is a car air vent. The air vent is typically a good choice because it’s near eye level and away from where thieves can see it. Consider the Square Jellyfish Jelly-Grip Car Air Vent Mount for your Apple iPhone 8 or iPhone 8 Plus. The Square Jellyfish Jelly-Grip mount opens to 3 5/8 inches and can be used to hold your device with or without a case or skin. It has a ball and socket so the cradle swivels into any orientation. This mount will work on flat vent slats that are 3/8 to 1 inch deep. The last car mount up for consideration is one for an unused CD player (which is the case on most CD players these days). The Mpow CD Slot Mount for SmartPhones uses a knob on the bottom to secure the mount within the CD player. That’s the one in the photo that accompanies this article. I prefer this mount to others in this category as it will permit a more custom and secure fitting. You don’t want the mount to rattle around inside the player. If you have enough clearance, this is a good mount to consider. Moving on to the motorcycle, consider the RAM Handlebar Mount with Universal X-Grip IV Holder. These heavy duty mounts come with a manufacturer lifetime warranty. The mount has gone through some rigorous shake tests and holds up well on a motorcycle. We wrote about X-Grips extensively on this site and you can view that article here. The expandable cradle opens to accommodate phones ranging up to 4.5 inches wide. The included u-bolt mounts to handlebars up to 1.25 inches which is a standard diameter for most motorcycles. There are a lot of mounts out there. As you select your mount, be certain it’s well made and features a tight grip on your Apple iPhone 8 or iPhone 8 Plus. Be sure the mount swivels into landscape or portrait and is wide enough to accommodate your phone with a case or skin.